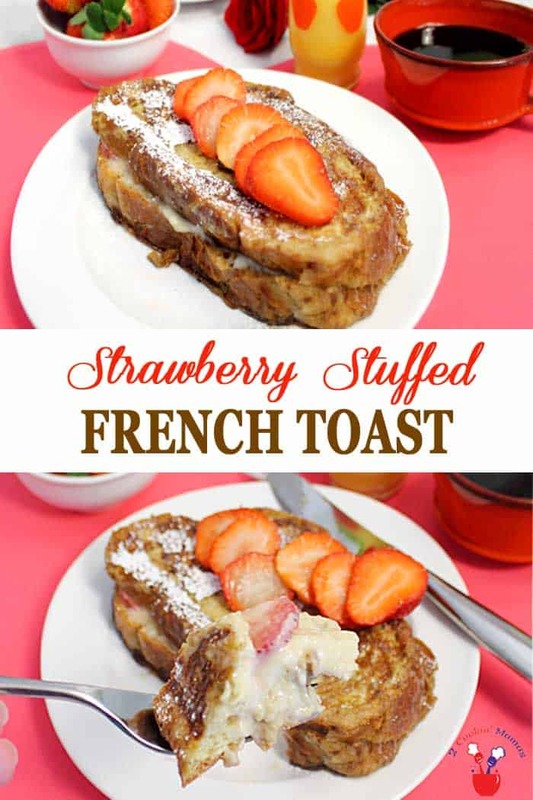 Strawberry Stuffed French Toast is a decadent treat for breakfast. 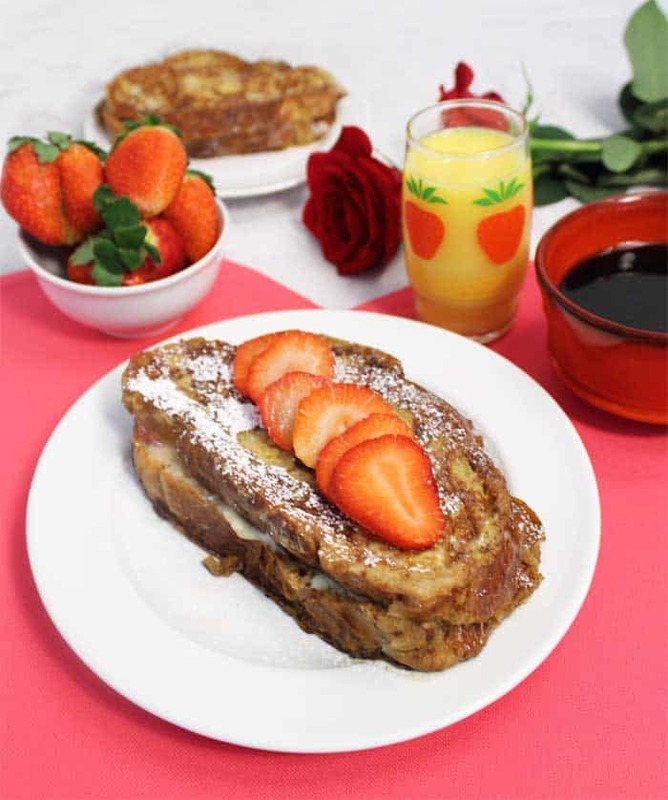 Traditional French Toast is stuffed with a sweet cream cheese filling then layered with fresh strawberries and browned to perfection. 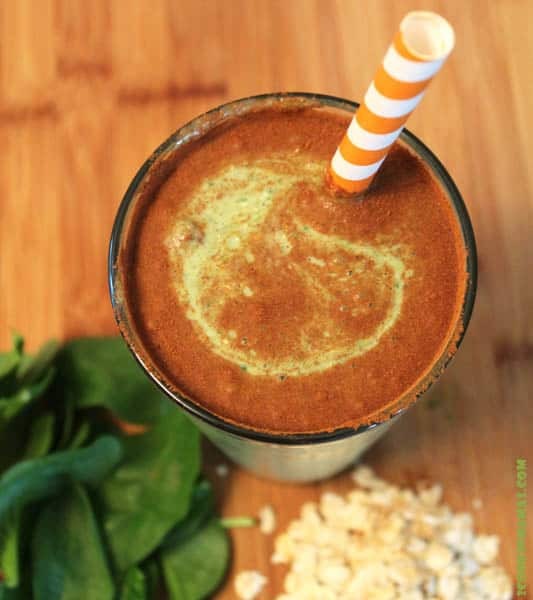 It’s like having dessert for breakfast! When I want a special breakfast, or get a chance to dine out, I always opt for the French Toast. I mean I love my Healthy Pancakes, Perfect Waffles and Egg Muffins but there is something about French Toast that calls my name. I mean, who wouldn’t like a brioche bread dipped in sweetened egg mixture and browned in butter then covered with syrup. Am I right or am I right? And did you know that French Toast was not even invented in France? Nope, it actually originated long before France was even a country. 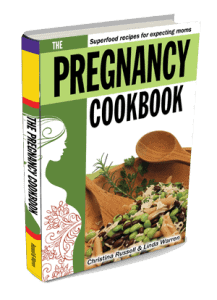 The first mention of it was found in a cookbook written in 4th century Rome and was called pain a la Romaine or Roman Bread. Well, I don’t know about you but I learned something new today. 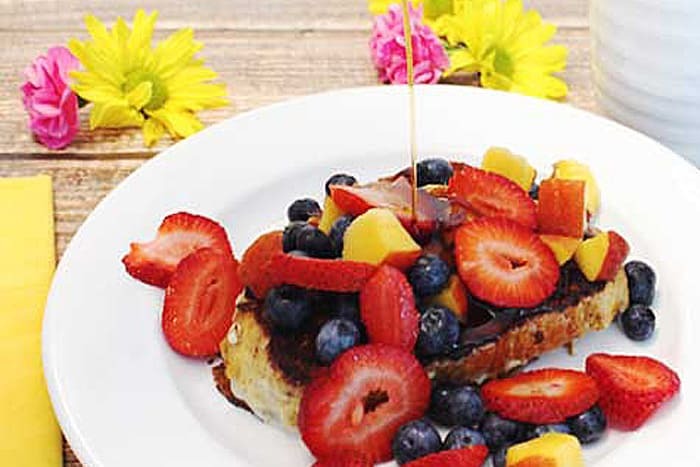 This Strawberry Stuffed French Toast goes one better than the original Roman Toast. It’s stuffed with a sweetened cream cheese filling and layered with strawberries. It’s almost like having dessert for breakfast! And, the best part, it’s quite easy to make and takes only about 30 minutes from prep to table. 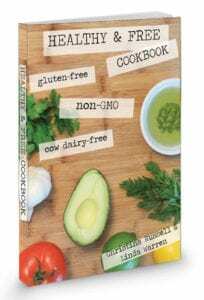 The ingredients are all something you probably have sitting in your refrigerator or pantry, except maybe for the cream cheese. And any bread will work although I do like to use either brioche or challah. First mix the cream cheese with a little banana, vanilla extract and confectioner’s sugar. 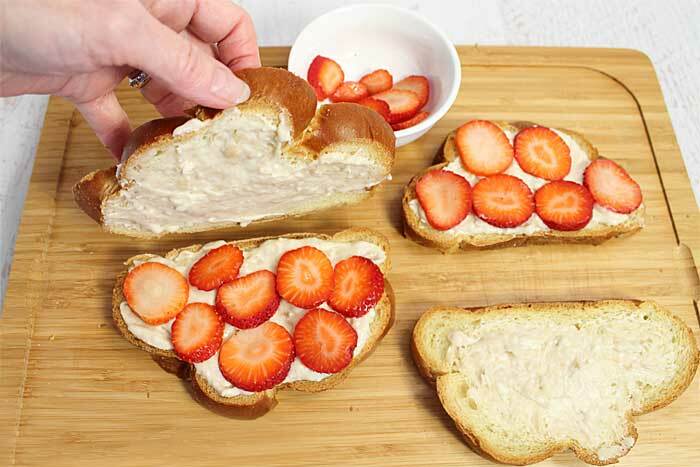 Spread on the bread slices then top one side with sliced strawberries. Place one slice on top of another to create a sandwich. 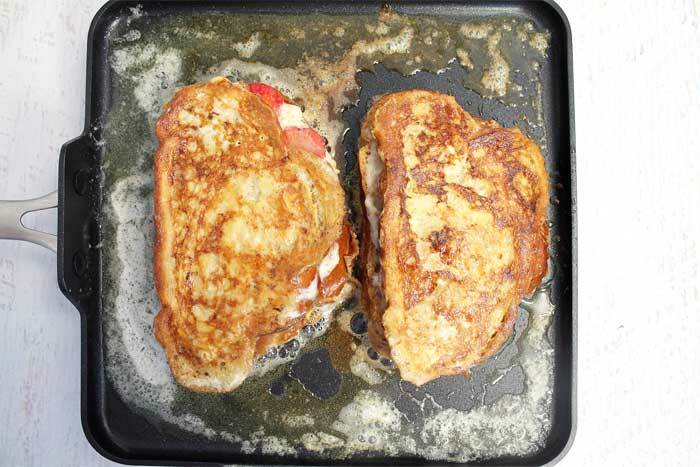 Lay each French Toast “sandwich” on a hot griddle with melted butter and brown each side. Doesn’t that look beautifully toasted? Place browned Stuffed French Toast on a plate and sprinkle with confectioner’s sugar then top with additional strawberries. If you like drizzle a little pure maple syrup over it too. 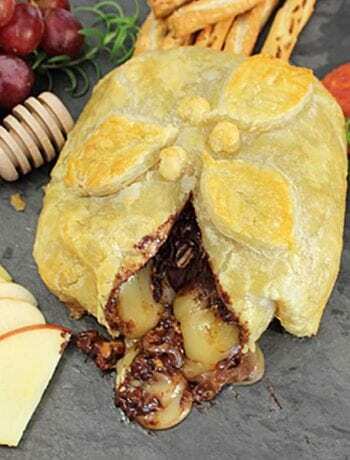 Now take a bite. Sigh, it’s sooooo good! Now isn’t this the perfect breakfast for a special occasion. Maybe you can surprise mom on Mother’s Day, your special someone on Valentine’s Day or a surprise breakfast in bed, just ’cause you want to! Whenever you have it, enjoy! 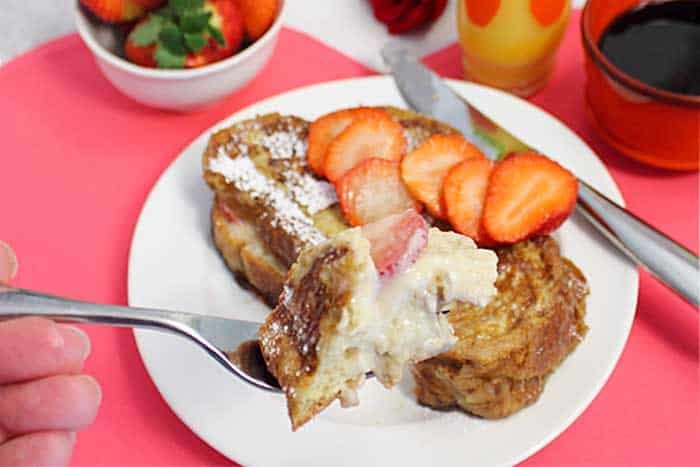 Strawberry Stuffed French Toast is a decadent treat for breakfast. 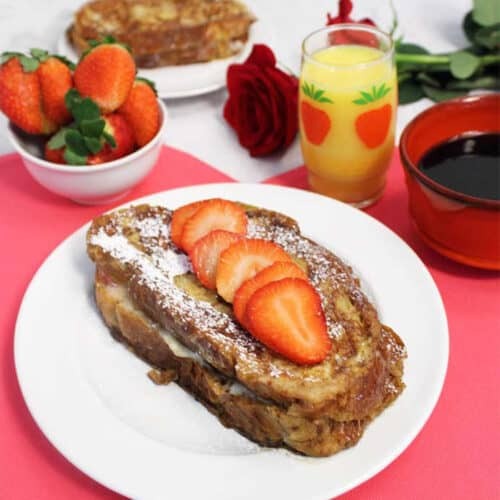 Traditional French Toast is stuffed with a sweet cream cheese filling then layered with fresh strawberries and browned to perfection. It's like having dessert for breakfast! 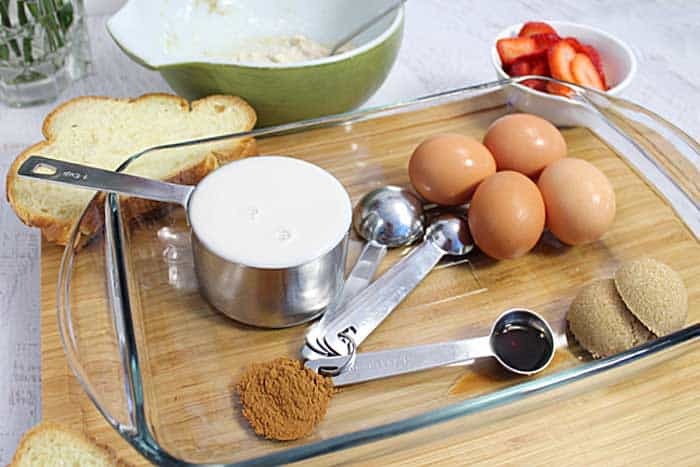 In a medium bowl, whisk all ingredients together for batter. Set aside. Prepare filling by whipping cream cheese and mashed banana together until smooth. Add in sugar and vanilla and mix well. Place slices of bread on plate. Divide filling between slices, making sure to cover top of each slice completely. Place sliced strawberries on top of 2 slices of bread. Place one slice of bread on top of another to make a sandwich and press together. Place 2 tablespoons butter on large flat griddle or skillet, turn heat to medium and wait until butter has melted. Take each french toast "sandwich" and, holding together, dip into batter until covered and well soaked. Place both on hot griddle. Brown well then turn and brown other side. Add more butter to pan if the toast begins to stick. 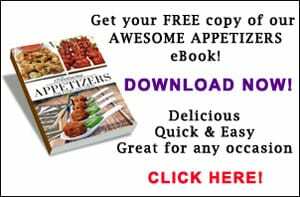 Check to make sure that cream cheese has melted before serving. 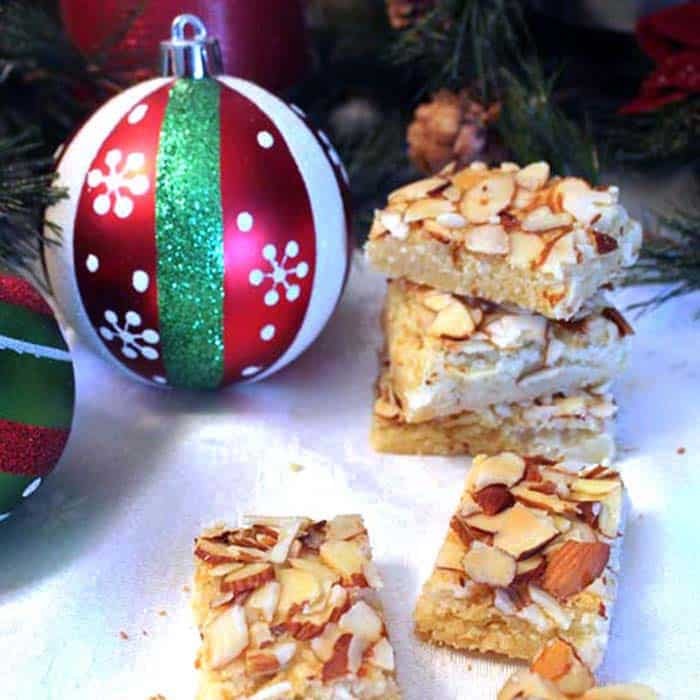 Serve with maple syrup or coat with powdered sugar. Garnish with more strawberries.